This is a sponsored post. Writing it got me on a plane home from Blogopolis. A plane I almost missed. 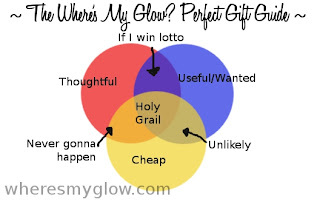 I am obsessed with finding The Perfect Gift. I am really easy to buy for, give me something shiny and I'll love you forever, and since I always get such amazing gifts I strive to give back at the same level. 1) It has to be thoughtful - just grabbing anything because it's the day before the birthday or Christmas Eve doesn't cut it. You need to prepare in advance. Start thinking about Christmas now. 2) It has to be useful/wanted - don't buy something that you want them to use but that they would hate, especially if you're only doing it so that they'll let you use it. This includes all domestic appliances, anything BBQ related, and car cleaning equipment. This is of course null and void if they have specifically asked for it. 3) It has to be cheap - wait, that's not what you expected was it? 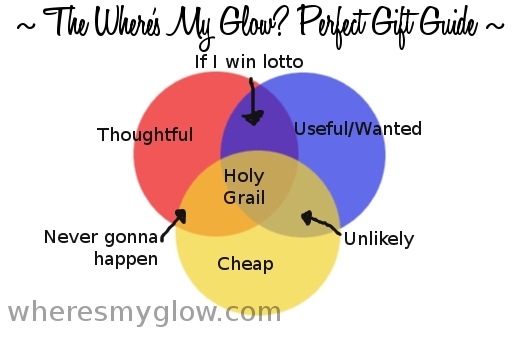 Well this is, after all, my guide to The Perfect Gift, and we all know I'm cheap. If it makes you feel better, say "value for money" and be snooty. Now there is one thing that I have come across that sits smack, bang in the middle, in Holy Grail territory... a gift subscription from Mag Shop! For the past four years Map Guy has been the recipient of a Wheels Magazine subscription because he is a bogan rev head... but I could find a mag to suit every member of my family. Mum - Woman's Day, Dad - Choice Magazine, Aunty Penny - Take 5, MIL - Burke's Backyard, FIL - 4x4 Australia, SIL - Rolling Stone, BIL - FHM. And because they keep getting a present weekly or monthly, it makes you look really good. Just think about it, you've had a bit of a tiff with your hubby and then the next day his copy of Inside Sport arrives and voila! all is forgiven. Are you a magazine fiend? Do you subscribe or head to the shops each month to grab your mags? Seriously awesome diagram - patent that! I worked for 6 years for a major media house - which equaled free mags GALORE! I seriously couldn't keep up with all my reading! Now having left the fold a few months back it pains me to have to pay for something I was so used to getting for free. That being said I took advantage of our affiliation with Magshop to rustle up a couple of subscriptions before I resigned, so am still getting a little of my mag fix. And agree, they are perfect gift ideas - they just keep giving :) ! I am obsessed..OBSESSED with Who Weekly and OK Magazines. It's very sad and handing over $9.30 every week to the newsagent is adding up. I went to Mag Shop and bought my own subscription to Madisson because Mr SawHole bought me a 36-pack of glasses the year before. I love magazines! My main ones I am subscribed to are InStyle and Marie Claire. When I'm shopping I will usually grab a womans weekly if it looks interesting. I just love getting inspired and keeping up with whats out there! Love a good magazine. And you are right, the fact that it keeps coming month after month is great. I went through a mag shop phase a few years ago, but had totally forgotten about it! The gift that keeps on giving. Love the Venn Diagram BTW. See kids, you can use something from school maths class in your everyday life. You totally rock the Venn Diagram! Agreed, they make a great present, the gift that keeps on giving! Am just about to go organise subscription for my BIL's birthday (I'd go get it from Mag Shop but it's an OS publication). Me, I'm too cheap to buy magaizines, I just pick the longest queue at the supermarket and catch up on goss while I wait! Preaching to the converted here - am very partial to magazines. Went off them for a while, but they're back on my love list now. I love the beautiful pictures and clever designs a lot of them have. Loved them most when I could borrow them from the library for free. I didn't care that they were out of date by then - free is free! No seriously, a very good idea! I'm going to incorporate this into gifts if I can. Perfect for my mum! I used to be a magazine fiend, but now I borrow them from the library instead of buying them. I love a good mag subscription! Loved your venn diagram :P I've recently started subscribing for a few, I found it's a bit more cost effective than buying them each month! What a fabulously written post - you really made me laugh and the diagram was the super-ace cherry on top - well done! I'll certainly be considering a mag subscription now. She of the fabulous leather gloves has commented on my blog!!! Thanks so much for comment, Cheryl, you have me blushing! I think the world needs more Venns. I'm quite partial to reading the 1993 Reader's Digest at the GP's office. Sharing is caring, Miss Pink! Ahhh free. My second favourite F word. I need to contact my maths teacher, she'd be so proud. I'm very low maintenance. Especially when you ignore the fact that I need lots and lots of attention and praise. I looooove getting mail too! And yep, you're a bit obsessed, but it's all good, I won't tell. I used to work at a hairdressing salon that subscribed to every single magazine you can think of so that our clients would have up to date reading material. Every lunch break I would sit in my little beauty room and devour the gossip! Bahaha a magazine junkie hey? Do you panic when then there's a new issue and you haven't bought it yet? Wait, don't answer, I already know. I really hope Grace below you reads your comment... she may weep. My dad is really hard to buy for. He loves fishing, but his kind of fishing rods and reels and in the thousands and I'm not rich (or stupid) enough to spend that much money on stuff for a boat. So I got him a subscription to one of the fishing magazines so he can drool over the expensive rods every month and I don't have to buy them!